MIDI might be a little long in the tooth as protocols go, but it's been the prevailing standard for getting music hardware and software to play nice pretty much since its inception. As such, the MIDI controller is a fairly established staple in professional and bedroom studios alike. The problem is they're generic by nature. They come in all shapes and sizes, but to be profitable, they need to appeal to a broad range of applications. Ableton clearly didn't think this arrangement was up to snuff, though, so it created Push -- a software controller built entirely for the latest version of its popular Live production software. 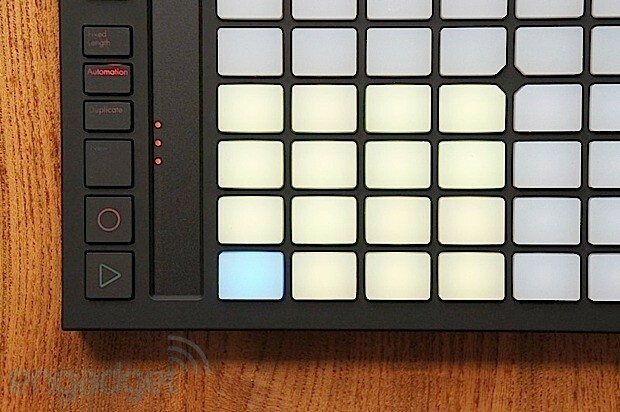 While there have been Live-specific controllers before -- some even officially endorsed by Ableton -- Push is a whole new beast. It's one that hopes to unite hardware and software in a way that an all-purpose controller never could. Ableton also has lofty musical ambitions for Push: it claims it designed the hardware as an instrument in and of itself; something that lets you close the lid of the laptop and use to make music with, while not looking like you are checking your email. And, given that Ableton makes the software that it's building Push for, integration is understandably expected to be airtight. But how well does it work? Is it an instrument? Will it replace all your other controllers? Do you want one? Is it worth the $599 pre-order price? Will it blend? We've pushed ourselves to explore the device fully in an effort to find out (apart from that last question, of course). 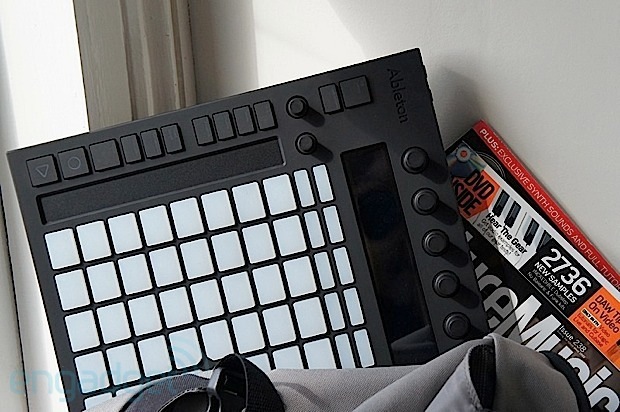 A great debut controller from Ableton that makes efficient use of a modest footprint. More controls for audio would be nice, but there's definitely something for all levels of users. We already alluded to the fact that there are myriad MIDI controllers in all shapes and sizes, but there are two in particular that are worth knowing about before we go on for context -- Novation's Launchpad and Akai's APC40. Both are Ableton-specific controllers, which arguably have at least in some way influenced the Push we're evaluating today. With those fresh in our memories, let's look at Ableton's spin on things. There aren't many mass-produced controllers that feel and look as well-crafted as this. Remove Push from the box, and the first thing that strikes you is how dense it is. The square device measures 14.5 x 11.5 x 1 inch, and weighs 6.6 pounds. The weight falls very much into the "reassuringly heavy" category, though if you're a fan of lighter units such as the Launchpad, it might initially feel a little cumbersome. Bar a few connections around the back, all the action can be found along the top surface. A large 8 x 8 grid of white rubber pads takes center stage, flanked on the left and right by smaller black buttons with a different, harder, plastic feel than the central white ones. Above the central grid are another two rows of smaller buttons, an LCD display and nine rotary controllers. On the left side, there's also a touch-strip between the center pads and the black control buttons. Overall, the finish of the casing feels great, and is of the soft-touch variety -- similar to that found on many phones and tablets. The pads in the central grid are pressure-sensitive (how hard you push affects the sound) and feel extremely firm / mashable, with only a small amount of travel. The black buttons on either side, however, are slightly looser and have more of a "clicking" action. All the rotaries are endless (you can twist them forever), and are entirely smooth in their motion, bar one, which has a notched action to allow easy setting of fixed values. None of them are clickable, as is sometimes the case, but they're touch-sensitive up top, which adds extra functionality. Those other ports we mentioned earlier all sit along the rear of the device, and include a brushed-metal power button, a 6V DC input (adapter included), a USB port and two 1/4-inch jacks for pedals. We have to say that we've handled more than our fair share of MIDI gear, and there aren't many mass-produced controllers that feel and look as well-crafted as this. The design is very much in keeping with Ableton's approach in the software realm, and has a very strong sense of minimalist aesthetic simplicity. This, combined with the quality of the build, really does make it an object to behold. It gets as close to some of the more bespoke or niche controllers (anything from Livid, or Monome) as we've ever seen in a mainstream device. It's worth noting, too, that the hardware has been produced in partnership with Akai, so not only is there some heritage in those pads, but it's been built by the company that effectively makes a competing (albeit older) option. The launch of Push coincides with the long-awaited arrival of Ableton Live 9 (the only version it currently works with). While we're not going to go too far into the software side of things from a review standpoint, it's important to explore how well Push does its job -- which ultimately is letting you control the software. There will be some assumption of basic knowledge of Live, as most people interested in buying are probably using it already. We'll start with the two main views in Live -- Arrange and Session. Push is almost entirely interested in Session view. Within this part of Ableton Live, there are broadly two things you will want to do: create new clips of music, and play / trigger these clips in a musical, ordered fashion. Push lets you do both of these tasks, and we'll approach both separately. Connect Push to your computer (via USB, no drivers, etc. required), open Ableton Live and the device springs to life. The previously unlit pads display vibrant colors, and the LCD screen lets you know that Ableton is asking you a question. That question is "Would you like to start a new song?" Clicking "Yes" will automatically drop Push into drum-machine mode, having loaded up some default instruments in the software automatically. In this state, the 8 x 8 grid divides itself in three. The bottom-left 4 x 4 pads represent drum sounds (touch the slider to scroll up and down through even more sounds), while the bottom-right quarter of the grid serves as a clip-length control (press and hold the first pad, tap the fourth for a four-bar loop, etc.). The remaining 8 x 4 pads above now function as a step-sequencer -- with a sound selected, tapping these adds drum hits in the respective position in the drum loop. This is intended to serve as your starting point for a new song, letting you lay down a rhythm straight away. Push lets you add drum hits by tapping the pads on and off as the loop plays, but you can also record a pattern in live if you're a bit of a finger-drummer. This is where we break out onto the outer black buttons, which (among other things) contain controls for quantize, delete and -- thankfully for us -- undo. So, you've got a little drum beat going and you'd like to spice it up with a melody. No problem, says Push. The top-right cluster of black buttons lets you change focus between clips, devices, tracks and so on. 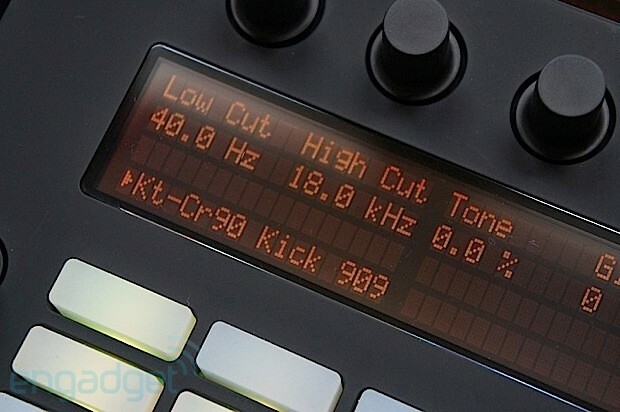 Ableton will have automatically loaded a pitched instrument in the software, and making this the center of Push's attention is just a button click (or two) away. It will depend on what you were doing last, but the black controls helpfully light up when they are useful, and remain dim when they are not. The LCD display also shows the current function of the buttons directly below it, which, in the current state, means switching between tracks in our project. With our pitched instrument selected, the grid on Push changes from the step-sequencer view into its method of notational input. So, you've got a little drum beat going and you'd like to spice it up with a melody. No problem, says Push. To achieve this, the pads essentially become piano keys, the arrangement of which can be heavily configured to your preference. A scale button lets you change the musical key and whether it's minor or major (or a host of other exotic scales). You can also change the grid to represent either only those notes in the key you have selected (never play a wrong note! ), or to offer all the notes chromatically. This is where it tackles a significant challenge: allowing experienced musicians and one-finger wonders alike to "play" it as an instrument. Again, without drifting off into theory too much, the way the pads represent notes has been arranged so that you can rattle off scales, chords, etc. if you so wish. 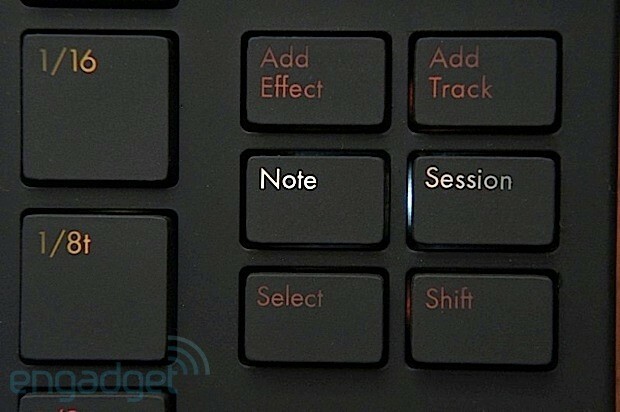 It can also provide gentle guidance to those who are perhaps a little more used to drawing in their MIDI notes one by one with a mouse. While there's much more to explore for each of the above two instrument styles, the other main mode of operation is as a clip launcher. This is akin to the most basic function of Novation's Launchpad, whereby the 8 x 8 grid represents a corresponding section of your project. In this mode, one pad represents a MIDI or audio clip, which will start to play when pressed. Again, like the Launchpad, you can set off whole "scenes" (or rows) of clips easily with the corresponding black button to the left. There is a four-way navigational pad in the lower-right corner of Push, and this can be used to move the 8 x 8 grid's focus around your session. If you have a really large project, with hundreds of clips, pressing (and holding) shift will present a zoomed-out view, where each pad now represents an 8 x 8 section of a project, letting you quickly jump about to different parts of the session. Feature-wise in this mode, things are pretty straightforward, and a well-constructed project can be navigated and performed with ease. So, while you might be more interested in performance or production with Push, in reality, the two tasks can also be combined somewhat seamlessly, which is quite the exciting prospect if you've so far been using multiple devices to achieve something similar. In general, and if you know the software, most of the controls feel intuitive. But, if like us, you want to explore what everything does right now without reading the manual, it can be a little frustrating on the first go. We'll admit that our first five minutes with Push weren't quite as straightforward as we'd hoped. Creating clips of drums and melodies was simple enough, but figuring out only slightly more advanced actions -- such as duplicating a clip, or trying to add a plug-in / third-party instrument -- had us jumping back and forth between modes looking for the right button. This is likely more down to our enthusiasm, wanting to be experts right off the bat. The second session with Push felt a lot more natural, and intuitive. Fortunately, it doesn't matter how much you know about Live, as there is adequate documentation to get you going no matter how patient you are (or in our case... not). Rhythms and melodies can be played expressively, and experimental ideas (and happy accidents) suddenly become easier and more frequent. Once the workflow clicks, however, the fun really begins. The difference a MIDI controller makes to your creative workflow is already significant. So having one that's purposely built for the software it is controlling only serves to ramp up that sense of using a hardware instrument, rather than a virtual one. Rhythms and melodies can be played expressively, and experimental ideas (and happy accidents) suddenly become easier and more frequent. Ableton Live already had a reputation for allowing you to get ideas down quickly, and Push really does expedite that process even more. This, for us, is its strongest suit. There are small concessions being made. For example, keyboard players might prefer a regular piano interface, and drummers may like bigger pads, etc., but Push still manages to deliver all of that functionality in just one device, and does an honorable job, at that. But it's definitely the sparking of new ideas that really makes this worth a look. If you regularly find yourself wheeling out the same patterns, Push might be just the creative kick you need. It's also worth noting that you have to commit to a certain amount of preparation first. If, like a great number of users, you're interested in using Ableton Live with third-party plug-ins, things understandably aren't as native as they are with Live's built-in instruments. You can work around this by creating instrument racks, and allocating macro controls to the most important features of your instrument. Live will even display whatever you choose to label it on Push's readout. This is great, but it means when you are creating a new MIDI track, and browsing for instruments, that you can only add those from Live's suite, or instrument racks you've created as described above. Given that Ableton has no control over third-party instruments, it seems a little unfair to mark it down for this. But on the flip side, you'll likely find yourself organizing your library, instrument and sounds in a new way to accommodate Push, and the side effect is that your whole workflow will benefit, even if you might be doing it reluctantly. As we've established, asking Push to be able to do everything for everyone right out of the box is a big request. But, with a user mode that lets you map your own configuration and Max for Live, there's a very good chance that the community at large might fill in many of the blanks in short order. Perhaps this is something Ableton considered when deciding where Push's competencies should lie. 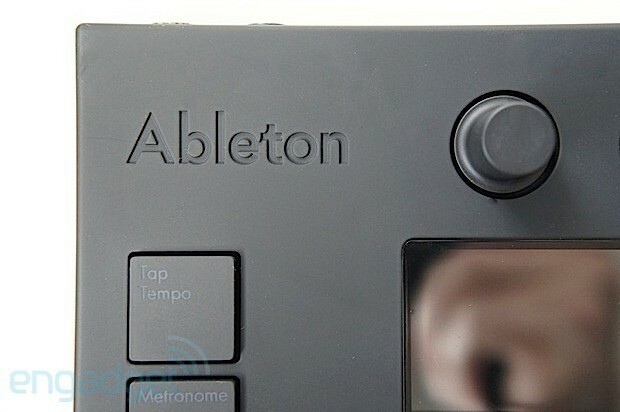 If you want something that will bring every function, option and submenu of Ableton Live within physical reach, then you're likely asking far too much of any software controller. If, however, you want a device that makes Live feel more like dedicated hardware, then this goes a long way to achieving that. But, is it for everyone? Well, that's a hard question. Making music -- especially in the digital realm -- is a very personal affair. There aren't any best practices as far as workflows go. What Push does, though, is bring Live out from the screen and under your fingers in a way that not many other controllers can match (in terms of 1:1 function mapping). As always, there are trade-offs, with one of the biggest being that there aren't nearly as many controls for audio as there are for MIDI. If you were perhaps thinking about using this to record audio on the fly, loop things up and build a track that way, then you might want to try one out for yourself first, or adapt your workflow to make this fit. There's no doubt you would be able to configure it with the User mode to do all of those things, but it's not really part of the native workflow a device like this sells itself upon. The User mode is a great catchall feature, but it's there to make up for all the functions that Ableton didn't give a fixed amount of hardware resources to. Above and beyond all of that, Push is immense fun, and will likely provide a creative jab in the arm to almost any Live user no matter what their usual workflow is. And, to be fair, whether you're a jobbing, aspiring or recovering musician, that's pretty much the best "feature" you can ask for. 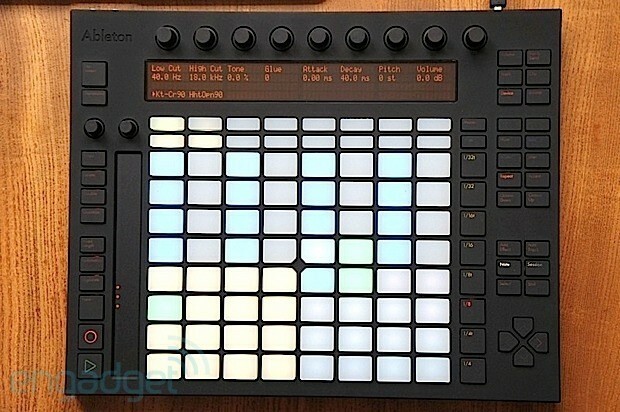 If you're completely new to Ableton Live, the $1,198 asking price for Push and Live 9 Suite ($948 for Live standard) might be a big chunk of change. Existing users can pre-order the hardware by itself for $599, which, while not unreasonable, is a price that would get you both its nearest competitors with change leftover. This will no doubt be the biggest source of user debate, but we're pretty sure once you actually laid hands on it, there's a good chance you might find yourself justifying the cost. After all, you can't put a price on creativity, can you?